(1), Tap: Put a storage counter on Calciform Pools. 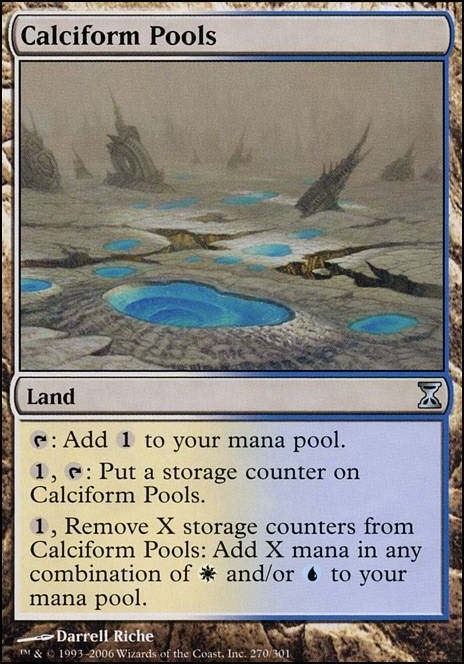 (1), Remove X storage counters from Calciform Pools: Add X mana in any combination of (White) and/or (Blue) to your mana pool. How about Exotic Orchard, Bountiful Promenade, Sea of Clouds and Morphic Pool instead of Halimar Depths, Sunken Hollow and Calciform Pools? You may also consider Fellwar Stone for ramp. Fuel for the Cause is not that great, since it is a 4-mana counterspell. I think your deck looks fine. Some of the best cards in your deck are Duelist's Heritage, Faerie Artisans, and Birthing Pod. Duelist's Heritage is like a better propoganda in my opinion, because it still incentives your opponents to attack elsewhere because they get more damage in and they think it was their idea. Faerie Artisans is fantastic because a ton of creatures in EDH have valuable ETB triggers, and also produces value outside of your GWU colors. Birthing Pod is the probably the best card in an optimized deck. I've seen a BUG deck built around it, and a cEDH deck built around it and Blood Moon. I've also seen the top voted Derevi decks on tappedout use Birthing Pod and Yisan Wandering Bard, so it's extremely popular. I think it's because those pilots have early stax pieces and ramp pieces like Arbor Elf, Ethersworn Canonist, etc. 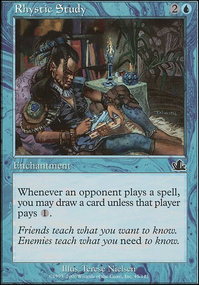 So if you're considering making your deck more competitive, I would add tutors/protection for Birthing Pod, and more 1-drop elves that can also make Derevi triggers by attacking, but I think your ramp pieces are fine. It's a good thing that you're pretty much done setting up with ramp pieces at turn 2. I know you're concerned about more hatebears and stax, but I think Derevi is the commander that can properly pull it off. Derevi can be reliably cast for four mana and not be countered, and you already have some counterspells to stop any board wipes so you would've have to replace many cards to protect them. 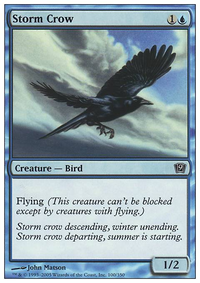 I still didn't have the stax theme in my Derevi deck for the aforementioned reasons, and because Winter Orb is not permitted in the casual EDH social contract haha, so I wouldn't be the person to talk to for that. And by glancing at your deck, I don't think Mirror Entity is good, but I do think Loyal Drake and Aven Mindcensor are good. Mirror Entity is fine because Derevi can pull off big mana plays and favors a wide combat strategy, but creature has to already deal damage for Derevi to trigger, so all the Derevi-supported mana can't go through Mirror Entity like I assume you want it to. Aven Mindcensor is great for obvious reasons and is evasive. 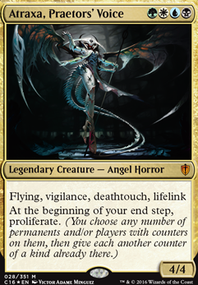 Loyal Drake is a practically a Phyrexian Arena but on a body, and favors a commander that can be reliably cast I like the touch of graveyard hate you put in with Scavenging Ooze, so I thought I should also mention Remorseful Cleric which is evasive. Also consider Tetsuko Umezawa, Fugitive, especially if you're including the 1-drop elves. I don't see the value in having Opposition because the commander can be reliably cast. I think Sigil Tracer is also a weaker card, because although you can always cast a wizard (Derevi), it only supports 14 spells, and only 6 spells if you take away counterspells and board wipes. Bident of Thassa is fantastic in your deck, especially because it clears the combat map. Your manabase looks fine too, and I thought I should mention Tolaria West, Saltcrusted Steppe, and Calciform Pools, because mana storage in Derevi is great. I hope this helps! I agree with the manafixing and card draw comments above. Anyhow, I like the perfect mana-curve. This is a very solid start. So, after looking at your landbase I have some suggestions. Since you're running Atraxa you have the unique opportunity to take advantage of Proliferate. 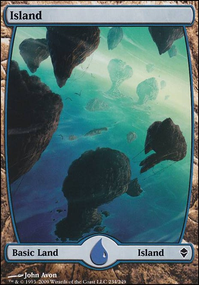 Some lands that may be of use to you are the TimeSpiral Storage Lands, aka: Calciform Pools, Dreadship Reef, and Saltcrusted Steppe. 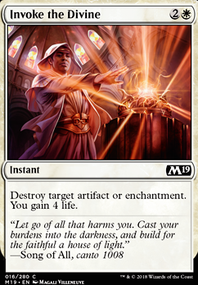 Then to support your proliferation madness you could use Mage-Ring Network, Gemstone Mine (because you could just keep proliferating the counters on it, making it punishment free), and Mirrodin's Core. To make room, i'd try and cut your manabase down to around 33 lands. I would probably cut some of the Check Lands, but I would definitely cut Krosan Verge for one of the previously mentioned mentioned cards I suggested. Now, to properly set expectations: these are essentially special Planeswalker Decks for a Chinese audience. Despite the fact that they are packaged together, I would suggest thinking of them as Planeswalker Decks, not Duel Decks. Planeswalker decks were purposefully watered down, a product that had little to offer more experienced players. Sorry for the rant, but all i'm trying to say is that you have much better options than Mu Yanling. Try Aminatou, the Fateshifter...just anything but that. 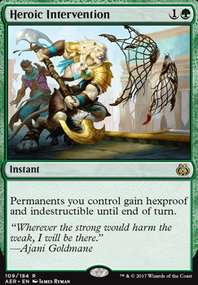 On an additional note, you could also run As Foretold because Atraxa can get that count up very high very quickly. 2 counters every turn (your upkeep + endstep) means you could pop out a free planeswalker on your turn, tap out, and still be able to play responses during other players turns (it says "Once EACH turn", not "Once on your turn") so that would be something to take advantage of. I think i'll cut myself off here...I have a few more thoughts regarding your deck but i'll playtest it a bit more before I comment again. Good stuff so far though!